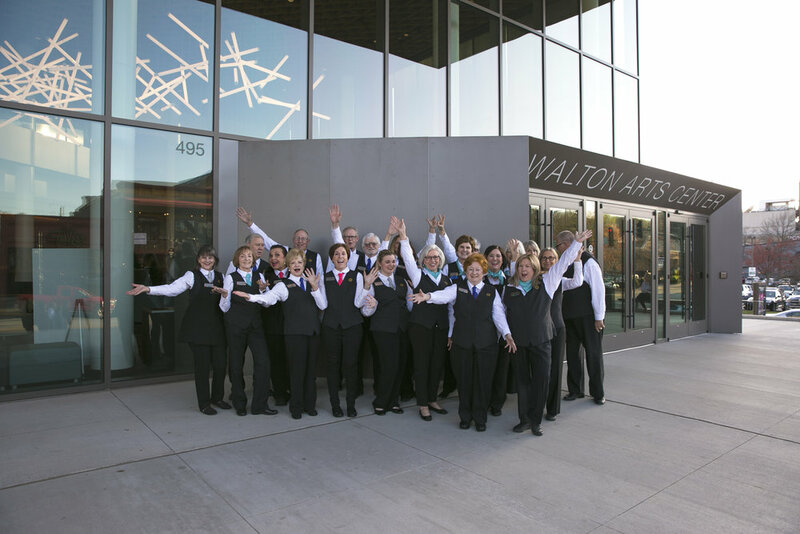 Walton Arts Center volunteers are a dedicated group of individuals who commit their time, talents and resources to support our mission of bringing world-class performances to Northwest Arkansas. These are the people who welcome you, serve you, seat you and are on hand to provide assistance and answer questions at every show. They also work every education show, unloading and loading kids from buses and helping them have a safe, fun and memorable arts experience. Our diverse group of volunteers represents an interesting cross-section of the Northwest Arkansas community. Some are locals and others are transplants who now call our region home. They hail from a variety of backgrounds and bring with them diverse experience, yet they all share a love for the arts and their community. Their gift to Walton Arts Center is priceless. Combined, this group of volunteers gave nearly 23,000 hours of service in 2017. Our philosophy towards our corps of volunteers is simple: the show could not go on without them! Assist in special tasks during annual events, like Artosphere: Arkansas' Arts + Nature Festival, Art of Wine Festival and Masquerade Ball. Every year Walton Arts Center honors our volunteers during Volunteer Appreciation Night. During this special evening, awards are given based upon years of service and number of hours, plus The Volunteer of the Year Award. In addition, we recognize volunteers throughout the year with a complimentary ticket program that allows volunteers receive tickets to shows. Volunteers are often highlighted in Bravo, the monthly newsletter for volunteers. We are always looking for additional ways to recognize our volunteers for their dedication and faithful service. Help us continue bringing arts experiences to Northwest Arkansas!